Very nice. Love the colors but what the hell medium was this done in, kind sir? Thanks David, This is simply a digital photo with a PS Hue adjustment. It reminded me of a Japanese Screen Print on silk when it took on this colour combination. Hi David .. definitely has the Japanese look to it. Eerily beautiful. Didn't think you painted it.. too many leaves... but I'm confident you could do a pretty damn good rendition -- if you wanted. Yes, per Bill I think you could pull this off. The Japanese screen is correct, this is authentic looking! A refreshing take on the tree that I thought I had seen enough of...apparently not. Hi David, i really like the (predominantly complementary) colour combination here in this image. It's also clever to me that while you have altered the colour histogram in PS, nonetheless the feeling of the Central Australian surreal light and heat has been retained, even augmented! ..an intriguing colour-expansive addition to your recent 'Red Centre' posts.. Cheers Bill& Nick, I'll take your votes of confidence although I doubt I'd try to tackle it as a painting subject. I know whay you're saying Nick re gum tree images but IMO the Ghost Gum is not your average gum tree. Thanks Wayne, I just enjoyed the balance of color and form that this manip revealed. I think there's something almost surreal about the landscape and flora in the outback. This image has some of that beautiful weird truth. I am looking forward to my trip through the red centre in June...I don't think there will be time to paint though...I am going on "The Ghan"! I think I will just have to take zillions of photos. Which is probably true of all people having outback experiences. A glowing good image David....! Hi David, no fancy words here in english or italian.. simply, i have been meaning to drop in for a while. You have a wonderful eye it seems also through the lens of your camera. What a wonderful take on our 'humble gum' - it looks surreal! i agree with you here.. 'reminded me of a Japanese Screen Print on silk' especially against that gorgeous sky! This gum is gorgeous. Love it. You are a wonderful artist. Hope that all is well in your life. I've been so crazy busy since last summer that I can't keep up. Hopefully will calm down soon. I really do love this style of painting (intensity contrasts using posterization type of design). The shapes are lovely and the colors...well....MONET. Kindest regards to you and your loved ones. 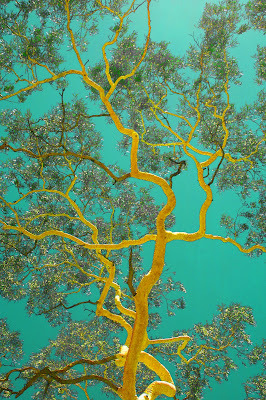 beutiful, the color is very important, like Vangogh with his almond tree.